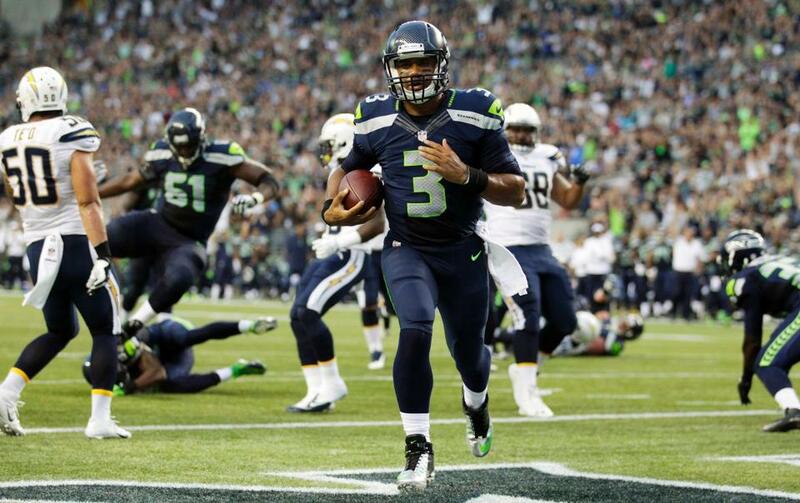 The Seahawks could not be clicking at a better time. In a game that to me was too close for comfort for the majority of the afternoon, the Seahawks found a way to pull away from the San Francisco 49ers late, escaping with a 17-7 victory. 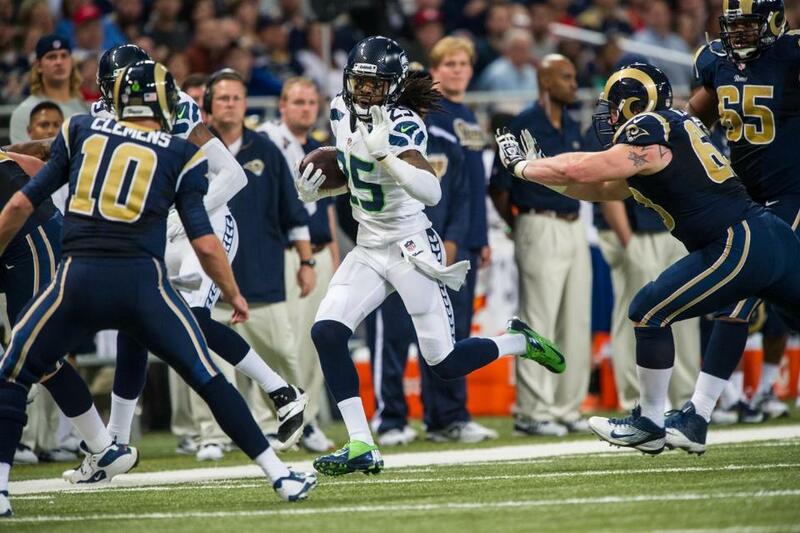 The Seahawks improve to 10-4 and will play for the NFC West lead next week in Arizona. The 49ers fall to 7-7 and with this loss they have been mathematically eliminated from playoff contention. The focus in Seattle is going to shift very quickly to next week’s game against the Cardinals but let me break down what I saw out of the Seahawks in this game. Offensive Line Struggles: The Seahawks offensive line may be the most inconsistent group on the team. 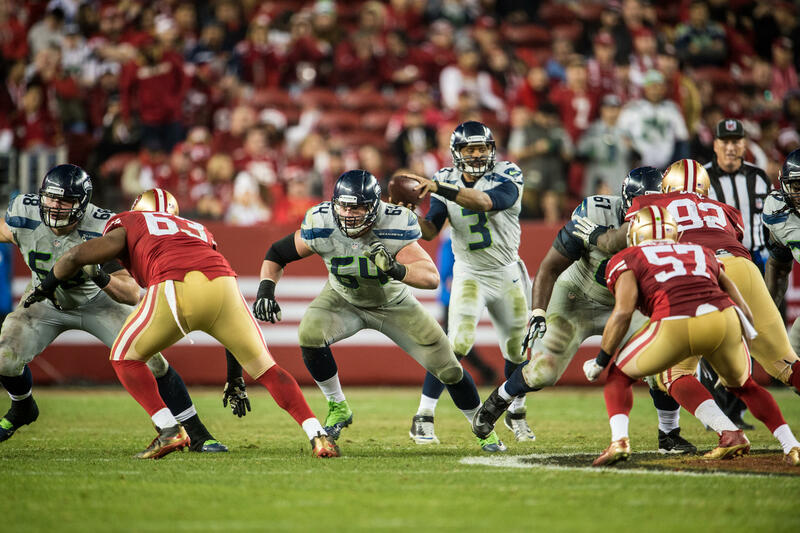 After keeping quarterback Russell Wilson clean the past two weeks, the Seahawks offensive line and a very difficult time stopping the pass rush of the 49ers. Wilson was sacked 5 times on Sunday and was hurried or flushed out of the pocket on the majority of plays that San Francisco blitzed 5 or more defenders. Justin Britt in particular had a hard time adjusting to calls at the line of scrimmage and picking up his blocks. In all honesty, the Seahawks played better in the second half after starting left tackle Russell Okung exited the game at halftime with a chest bruise. One silver lining is that the Seahawks offense rushed for 152 yards in this game, 91 of which coming from running back Marshawn Lynch. Looking ahead however, it will be extremely difficult for our offense to score points next week if the Arizona defense plays the way it did last Thursday in St. Louis. As dominating as our defense has played the past few weeks, 17 points on offense is not going to win us every game. With Max Unger hopefully back in the lineup next Sunday, I believe our offensive line can bounce back in a big way. Unsung Heroes: Paul Richardson caught his first career touchdown pass on Sunday, a 10-yard slant route which extended the Seattle lead to 17-7. Richardson gets the spotlight because of the touchdown but don’t forget about the roles wide receivers Doug Baldwin and Jermaine Kearse played on Sunday. Baldwin and Kearse caught two-thirds of Russell Wilson’s completions and combined for 131 receiving yards, including a 47-yard reception by Kearse and a 35-yard catch by Baldwin. Both plays came on first half drives which should have ended in points. 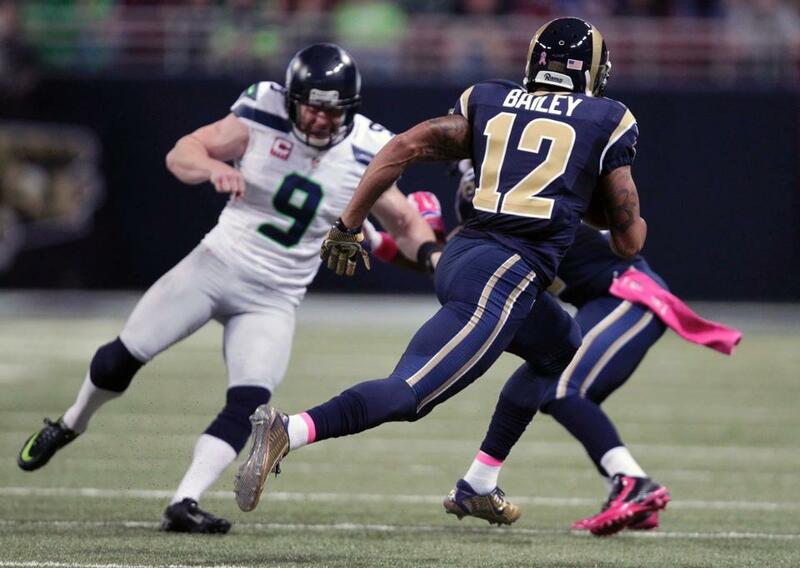 Instead the Seahawks came away empty handed. With the quality production from our top 3 receivers on Sunday it is possible that Russell Wilson is comfortable enough with his weapons to take more chances down the field. Kaepernick, Hyde Fluster Defense: I was not the least bit concerned with 49ers running back Frank Gore coming into this game. Gore finished the day prematurely, leaving with a concussion after gaining 29 yards. Instead the quickness of Carlos Hyde and the willingness of quarterback Colin Kaepernick to run seemed to catch the Seahawks off guard. The Seattle defense gave up 140 rushing yards to the 49ers on Sunday, the most allowed at home since week 6 against Dallas. Hyde was on a roll until he too left the game with an injury, leaving fullback Bruce Miller and third string running back Alfonso Smith to carry the load late in the game. The Seahawks defense found an answer to stop Miller and Smith but that also begs the question of would this have been a closer game if Gore and Hyde did not get hurt. Many of San Francisco’s runs went off-tackle and the Seahawks adjusted accordingly as the game progressed. Moving forward it may be beneficial if we spread out our personnel earlier in the game, especially next week against an Arizona rushing attack that averaged 4.3 yards per carry this week. Sacks for Everyone: The Seahawks team up with Jack in the Box and award a free Jumbo Jack to all fans if the Seahawks defense can record three sacks. For the first time, we the fans had our free burgers by the end of the first quarter and that was only a small sample of the dominance the Seahawks front seven displayed this week. The Seahawks dialed up the pressure all game long and it resulted in 6 sacks of Colin Kaepernick. The interior pass rush had me very satisfied, as defensive tackle Jordan Hill recorded two sacks and defensive tackle Kevin Williams had a sack of his own. Bobby Wagner and Bruce Irvin also had sacks up the middle, which goes to show how bad of a game 49ers backup center Joe Looney played. In our last 4 games the Seahawks defense has allowed an average of just under 7 points per game, by far the best average in the league. To me however, the lack of offensive production overshadowed the performance of our defense. 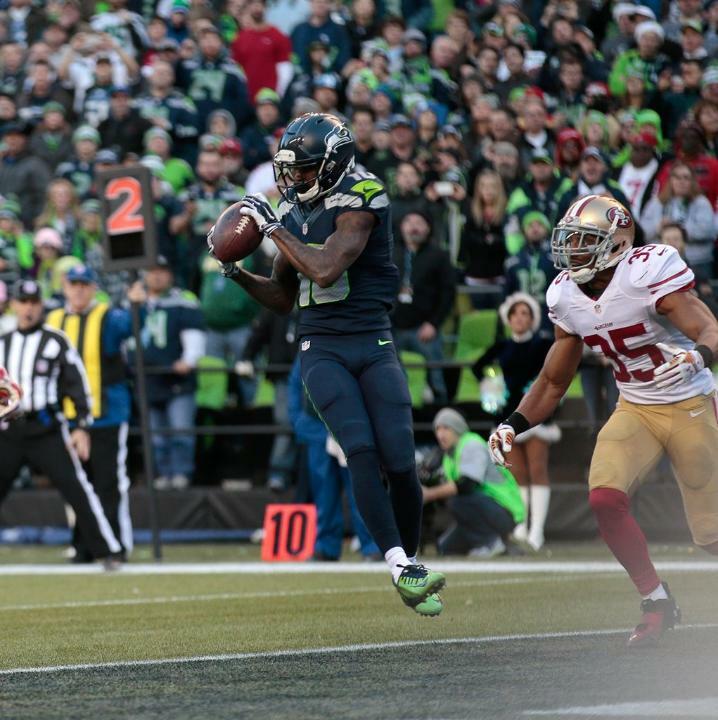 Upon reflection, when the Seahawks extended it to a two-score game it was definitely over. This defense needs to show up big next week. If the defense can stay on this path, it will be incredibly hard for Arizona’s third string quarterback to beat us next week. Thoughts on San Francisco: This 49ers team seemed to have played this game inspired but their prideful effort was too much for the talent the Seahawks threw at them. This was most likely Jim Harbaugh’s last hurrah as the head coach of the 49ers and you have to wonder how this season would have played out if they could have stayed healthy throughout. The 49ers are capable of bouncing back in 2015 but just like how Harbaugh coached Mike Singletary’s talent to the best of their abilities when he arrived in 2011, the same must go for whoever the 49ers next head coach is. The way the NFC West has been built in recent years however, it may take more than one year for San Francisco to get back to playoff contention. Random Thoughts: It was an earlier arriving crowd at the bar before the game. All tables were full by 9:15am. It was a very festive atmosphere that almost felt like a playoff game… That festive environment before the game seemed to dissipate real quick once the game started. It almost felt as though the 12th Man was taking it easy on the 49ers for the first part of the game. The intensity was not what I was hoping it would be but it got better later on once we took our first lead and the noise did not stop until the end of the game… In my opinion the Ebola ribbons handed out as the pregame giveaway was a huge failure. I saw no one wearing them. Literally no one… Great weather on Sunday. I love late season games with nothing but sunshine… John Olerud raised the 12th Man flag before the game; a legitimate candidate that I approve of… The blue endzones are back because the Sounders season is over. Thank goodness. I love the blue endzones. It gives the field a classic look… One of the highlights from the day was when they put 49ers coach Jim Harbaugh on the video board complaining after the questionable roughing the passer call which favored the Seahawks. The entire stadium booed. It was one of the loudest moments of the day. It was awesome… If we win next week, holy moly. That’s all I can say. This upcoming week is by far the biggest of the season. Check back Saturday when I preview our week 16 matchup against the Arizona Cardinals. Thanks for reading and go Seahawks!